The forthcoming release of KBpedia version 1.50 deals primarily with the addition of a relations schema to the knowledge structure. In the previous part of this series, I discussed the event-action model at the heart of the schema. Actions are external relations between two objects, including parts, for which we use the variable shorthand of A and B. In terms of the universal categories of Charles Sanders Peirce , these dyadic relations are a Secondness that we formally term External Relations, or A:B. But external relations do not constitute the complete family of relations. External relations are but one form of predicate we require. We need relations that cover the full range of language usage, as well as the entire scope of OWL properties. KBpedia is written in OWL2, which is the semantic ontology language extension of RDF. We need to capture the three types of properties in OWL2, namely object properties, datatype properties, and annotation properties. In Peircean terms, we thus need relations that characterize the subject itself (A:A), which are mostly datatype properties, as well as statements about the subject (re:A), which are annotation properties. Most external relations are represented by object properties in OWL2, but sometimes datatype properties are also used . We call relations of subject characterizations Attributes, and these are a Firstness within Peirce’s universal categories. We call relations about the subject Representations, and these are a Thirdness within the universal categories. The purpose of this part in our series is to introduce and define these three main branches of relations — Attributes, External Relations, and Representations — within the KBpedia schema. In accordance with the design basis of KBpedia, we use Peirce’s universal categories and his writings on logic and semiosis (signs) to provide the intellectual coherence for the design. For the analysis of relations, two additional Peirce manuscripts were closely studied. The first manuscript is the first one on logic relations by Peirce in 1870, which goes by the shorthand of DNLR . The second manuscript was from nearly 20 years later, known simply as the “Logic of Relatives” . These two manuscripts deal with the ideas of internal and external relations, or the Attributes and External Relations, respectively, discussed above, and relate more to the predicate side of propositions. 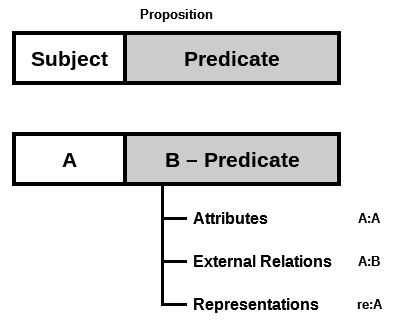 However, we also need to reference or point to the subjects of the proposition and to predicates, for which the Representations portion applies. Our need here was to organize a full breadth of relations in context with the universal categories, the needs of knowledge representation, and the structure of properties within OWL2 . The result, we think, is consistent with the Peircean architectonic, but modernized for KR purposes. “Now logical terms are of three grand classes. “The first embraces those whose logical form involves only the conception of quality, and which therefore represent a thing simply as “a ──”. These discriminate objects in the most rudimentary way, which does not involve any consciousness of discrimination. They regard an object as it is in itself as such (quale); for example, as horse, tree, or man. These are absolute terms. “The second class embraces terms whose logical form involves the conception of relation, and which require the addition of another term to complete the denotation. These discriminate objects with a distinct consciousness of discrimination. They regard an object as over against another, that is as relative; as father of, lover of, or servant of. These are simple relative terms. “The third class embraces terms whose logical form involves the conception of bringing things into relation, and which require the addition of more than one term to complete the denotation. They discriminate not only with consciousness of discrimination, but with consciousness of its origin. They regard an object as medium or third between two others, that is as conjugative; as giver of ── to ──, or buyer of ── for ── from ──. These may be termed conjugative terms. We take the first “class” above as largely relating to the Attributes. The next two classes, including the conjugative terms, we relate to External Relations. To this we add the Representations as the Thirdness within our revised relations category. Each of these three categories is described more fully below with further discussion as to the rationale for these splits. Peirce’s recommendations as to how to analyze a question proceed from defining the domain and its relations (the speculative grammar) to the logical analysis of it, including hypotheses about still questionable areas or emerging from new insights or combinations. The methods of this progression should be purposeful and targeted to produce a better likelihood of economic results or outcomes. This overall process he called the pragmatic maxim, and is a key insight into Peirce’s reputation at the father of pragmatism. In terms of Peirce’s more formal definition of signs, a proposition is a dicisign, and it consists of a subject + predicate. (CP 2.316) A predicate is a rhema (CP 2.95). In terms of OWL2 with its RDF triples (subject – property – object), the predicate in this model is property + object, or a multitude of annotations that are representations of the subject. Further, “Every proposition refers to some index” (CP 2.369), that is its subject (also referred to as object). “Thus every kind of proposition is either meaningless or has a real Secondness as its object.” (CP 2.315) The idea of an individual type (or general) is also a Secondness . “I term those occasions or objects which are denoted by the indices the subjects of the assertion.” (CP 2.238) The assertion give us the basic OWL statement, also known as a triple. Subject(s) and a general predicate make up the proposition (statement, assertion). Subjects need to be individual things (including generals) and are defined, denoted and indicated by various indexical representations, including icons and images. Active predicates that may be reasoned over include the attributes (characteristics) of individual subjects or the relations between objects. This basic structure also lends itself to information theoretics. “Every term has two powers or significations, according as it is subject or predicate. The former, which will here be termed its breadth, comprises the objects to which it is applied; while the latter, which will here be termed its depth, comprises the characters which are attributed to every one of the objects to which it can be applied.” (CP 2.473) Peirce importantly defines the total information regarding a subject to consist of the “sum of synthetical propositions in which the symbol is subject or predicate, or the information concerning the symbol.” (CP 2.418) In other words, information = breadth x depth. We can reason over attributes and external relations, but our total information also consists in our representations. These insights give us some powerful bases for defining and categorizing the terms or tokens within our knowledge space. By following these constructs, I believe we can extract the maximum information from our input content. Best practice using semantic technologies includes providing precise, actionable definitions to key concepts and constructs. Here are the official statements regarding this trichotomy of relations. Attributes are the intensional characteristics of an object, event, entity, type (when viewed as an instance), or concept. The relationship is between the individual instance (or Particular) and its own attributes and characteristics, in the form of A:A. Attributes may be intrinsic characteristics or essences of single particulars, such as colors, shapes, sizes, or other descriptive characteristics. Attributes may be adjunctual or accidental happenings to the particular, such as birth or death. Or, attributes may be contextual in terms of placing the particular within time or space or in relation to external circumstances. 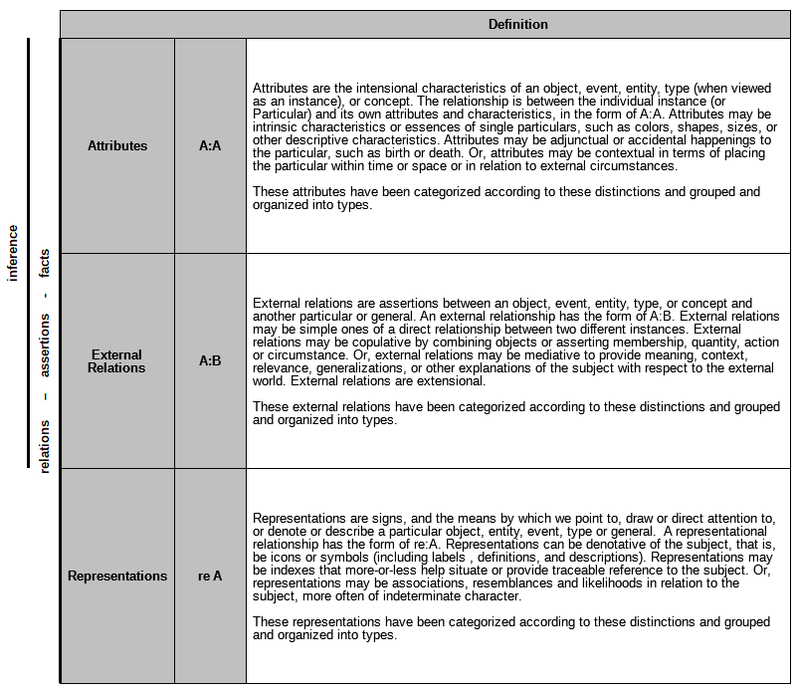 Attributes are specific to the individual, and only include events that are notable for the individual. They are a Firstness, and in totality try to capture the complete characteristics of the individual particular, which is a Secondness. These attributes are categorized according to these distinctions and grouped and organized into types, which will be presented in the next part. External relations are assertions between an object, event, entity, type, or concept and another particular or general. An external relationship has the form of A:B. External relations may be simple ones of a direct relationship between two different instances. External relations may be copulative by combining objects or asserting membership, quantity, action or circumstance. Or, external relations may be mediative to provide meaning, context, relevance, generalizations, or other explanations of the subject with respect to the external world. External relations are extensional. External relations are by definition a Secondness. These external relations are categorized according to these distinctions and grouped and organized into types, which will be presented in the next part. The events discussion in the previous Part II pertained mostly to external relations. The representational relation includes what is known as annotations or metadata in other contexts, such as images, links, labels, descriptions, pointers, references, or indexes. Representations can not be reasoned over, except abductive reasoning, but some characteristics may be derived or analyzed through non-inferential means. These representations are categorized according to these distinctions and grouped and organized into types, which will be presented in the next part. This trichotomy sets the boundaries and affirms the method by which further sub-divisions will be presented in the next installment in this series. We now have a much clearer way for how to build up the assertions in our knowledge representations, according to linguistic predicate construction and predicate calculus. 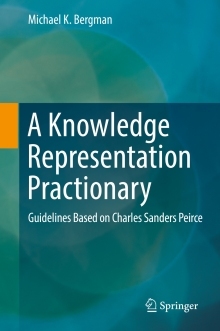 We can now explicitly state a premise underlying our choice of Peirce and his architectonic for the design of KBpedia: it is the most accurate, expressive basis for capturing human language and logical reasoning, both individually and together. Our ability to create new symbolic intelligence from human knowledge requires that we be able to compute and reason over human language. In the next part we will establish sub-categories for each of these three branches according to the universal categories . Attributes, External Relations and Representations comprise OWL properties. In general, Attributes correspond to the OWL datatypes property; External Relations to the OWL object property; and Representations to the OWL annotation properties. These specific OWL terms are not used in our speculative grammar, however, because some attributes may be drawn from controlled vocabularies, such as colors or shapes, that can be represented as one of a list of attribute choices. In these cases, such attributes are defined as object properties. Nonetheless, the mappings of our speculative grammar to existing OWL properties is quite close. In the actual KKO, these labels are replaced with AttributeTypes, RelationTypes, and RepresentationTypes, respectively, when talking about Generals, to conform to the typing terminology of the ontology. C.S. Peirce, 1870. “Description of a Notation for the Logic of Relatives, Resulting from an Amplification of the Conceptions of Boole’s Calculus of Logic”, Memoirs of the American Academy of Arts and Sciences 9, 317–378, 26 January 1870. Reprinted, Collected Papers (CP3.45–149), Chronological Edition (CE2, 359–429). The attributes-relation split has been a not uncommon one in the KB literature, insofar as such matters are discussed. For example, see Nicola Guarino, 1997. “Some Organizing Principles for a Unified Top-level Ontology,” in AAAI Spring Symposium on Ontological Engineering, pp. 57-63. 1997. Also, see Yankai Lin, Zhiyuan Liu, and Maosong Sun, 2016. “Knowledge Representation Learning with Entities, Attributes and Relations.” ethnicity 1 (2016): 41-52; the authors propose splitting existing KG-relations into attributes and relations, and propose a KR model with entities, attributes and relations (KR-EAR). See further M.K. Bergman, 2016. “A Speculative Grammar for Knowledge Bases“, AI3:::Adaptive Information blog, June 20, 2016. Peirce recognized the importance of being able to talk of the individual type or general as an object in itself. It was only until the revision of OWL2 that such punning was added to the OWL language. The KBpedia relations model is split into three main branches: Attributes, External Relations and Representations. This article in our series introducing KBpedia's new relations model describes each of these trichotomous branches in detail, and provides the design rationale based on Charles S. Peirce's universal categories.